Red Faction: Guerilla Multiplayer Demo now on PSN and Live! Posted byfycadmin	 May 21, 2009 Leave a comment on Red Faction: Guerilla Multiplayer Demo now on PSN and Live! This just in. I know what I’ll be doing tonight when I get home. THQ and Volition, Inc. today announced the multiplayer demo for Red Faction®: Guerrilla™ is now available for free download on Xbox LIVE® Marketplace for the Xbox 360® video game and entertainment system from Microsoft and PlayStation®Network for the PLAYSTATION®3 computer entertainment system. Developed by THQ internal studio Volition, Inc., Red Faction: Guerrilla is a 3rd person, open-world shooter featuring real physics-based destruction, a story-driven single-player campaign and robust multiplayer options. The multiplayer demo features ten-player Damage Control, an explosive new mode that utilizes Volition’s advanced GeoMod™ 2.0 Destruction Engine, to add a new twist to traditional capture-and-hold, point-based gameplay. 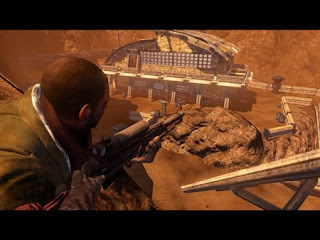 The demo comes less than two weeks before the anticipated June 2nd launch of Red Faction: Guerrilla on Xbox 360 and PLAYSTATION 3. The Mill: Revamped PSP and PS3 Before Year’s End?